With the weather getting warmer, I’ve started to go shopping at the Union Square Farmer’s Market/Greenmarket on Saturday mornings. I bought a bunch of leeks not really thinking about what I would do with them. 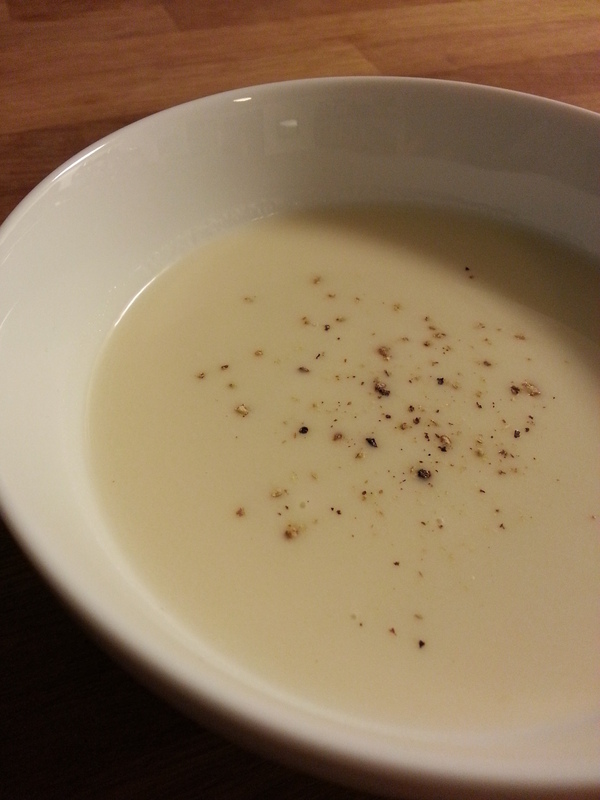 It was quite difficult to use them up so I decided to make a potato and leek soup: Vichyssoise. Since I wanted to have a cold soup, I used dashi instead of chicken stock. Dashi is really a solid alternative for making vegetable soups (or any soup or stew really). Doesn’t make it vegetarian, but it seriously enhances the umami and is a great option when you don’t have hours to cook chicken stock. All you do to make this soup is saute the leeks and onion in olive oil or butter until they wilt. Add the potato and cover with dashi (until they just about cover everything). Bring to a boil and simmer until the potato cooks all the way through (you should be able to crush them with your fingers). Add about a cup of milk (or more if you prefer) and bring back to a light boil. Season to taste with salt and pepper. Remove a few ladles of the dashi and set aside (this is just in case there is too much liquid and the puree turns out loose). Puree the soup using a hand held mixer or in a blender/food processor until smooth. If it’s too thick, add some of the liquid you set aside. I chose to strain this soup through a cheese cloth because I think it’s better to strain cold puree soups, but you can choose not to. Strain into a bowl over an ice bath so you can cool down the soup quickly. If you want it creamier, add as much heavy cream as you wish (I added about half a cup). Voila! I didn’t have chives so I just finished it with a bit of cracked white and black pepper.